David Esrati may or may not be the next Democratic Party candidate for Congress in OH-3, but, you can join him to watch the election returns at the South Park Tavern, 1301 Wayne Avenue starting at 7pm. Donation at the door will be accepted for Daybreak, South Park’s own runaway shelter. A percentage of all food sales will be donated to Daybreak, and we’ll accept donations for wine provided by Esrati supporters Pam and Juan. No matter who wins in the political race- Daybreak will win with your support. Special thanks to Bill Daniels, owner of the Tavern and the Pizza Factory, who is being generous enough to open the Tavern for this special event, and to come in and work it on his night off. The Tavern serves his famous Pizza Factory pizza. 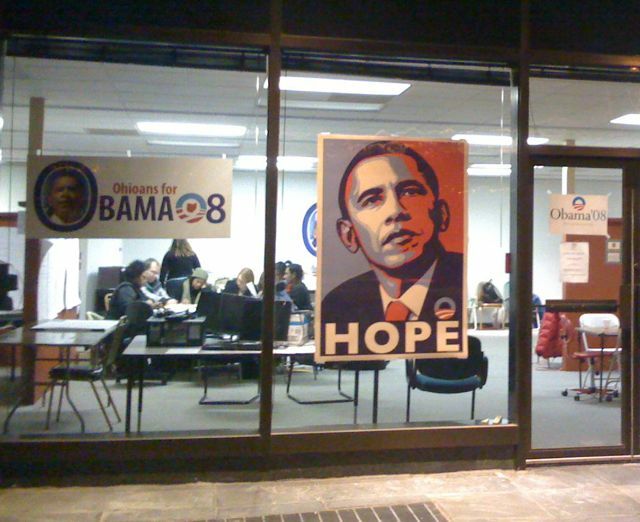 We’ll also raffle off the huge “Obama Hope” poster with all proceeds going to Daybreak. Tickets will only be available at the Tavern starting at 7. We will draw when the OH-3 seat is decided. Tickets will be 1 for $1, 6 for $5, 15 for $10, 30 for $20. We’ll also have a silent auction for a second print- sized to your liking up to 36″x 48″ with up to $200 in custom framing by neighborhood frame wizard David Crowell at Custom Frame Services. So- Two chances to win, one for the people who don’t have big bucks but want a chance at the big poster- and one for the price no object people. All money goes to Daybreak- so bring your checkbook. No matter who wins in OH-3, Daybreak will win. Wouldn’t it be great instead of having the best politicians money can buy (this presidential election is on track to be a $5 Billion dollar boondoggle) we could give all that money to a worthy cause. Buying media to promote sound bite politics isn’t really solving any problems. Donations to Daybreak will. Previous Post: My opposition must think voters are idiots.